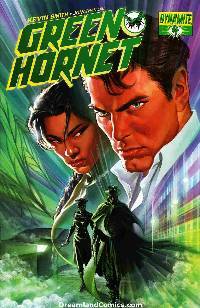 After the incredible events of the last issue, the legacy of the Green Hornet and its future are forever altered! There's not too much more we can say without giving away the thrilling events, but this issue features the aftermath of the battle with the Black Hornet, the original Hornet, Kato, his daughter and young Britt Reid! Featuring another awesome line-up of covers from Ross, Cassaday, Benitez and Segovia.